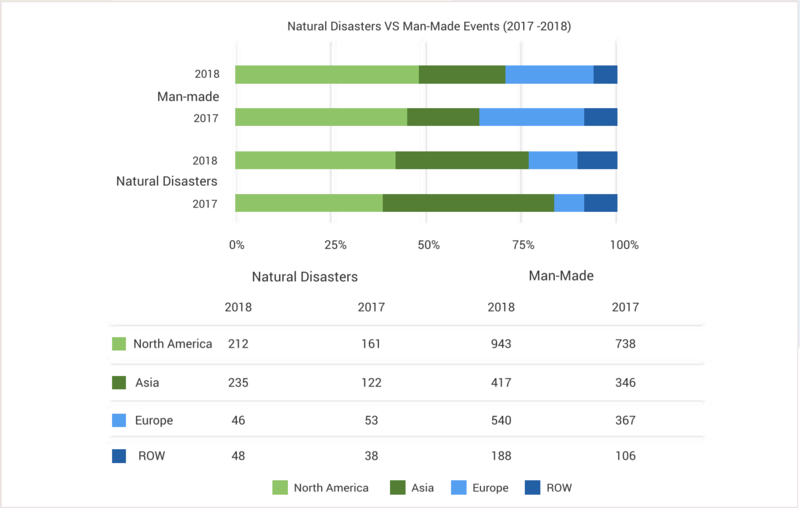 The chart above compares natural disasters and man-made disruptions in 2017 and 2018 by region (North America, Asia, Europe, and RoW). For the purposes of this chart, natural disasters include the Earthquake, Hurricane/Typhoon/Cyclone, Extreme Weather, Flood, Volcano, Tornado, Human Health, Power Outage/Shortage, Environmental Hazard and Forest Fire event types. Man-made disruptions include all other event types. Asia became the most disrupted region by natural disasters again in 2018, trading top position with North America from 2017.